There’s a major traffic jam developing in an area of Los Angeles—yeah, nothing new—but the traffic we’re speaking of on this day is inside the Natural History Museum of Los Angeles, at its new “The Story of P-22: L.A.’s Most Famous Feline” exhibit. 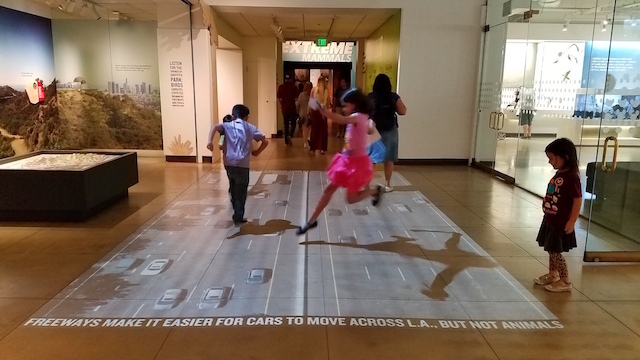 There, at the ground-level entrance to the popular Nature Lab, a growing crowd of kids and adults are attempting (and mostly failing) to cross 10 lanes of busy L.A. freeway traffic without getting hit, at least virtually, in one of the interactive pieces featured. One of the kids, whose mom was trying to get his attention, shouts to her, “Hold on, Mom, I’m playing Frogger.” This particular piece projects video of rush hour traffic on the 5 Freeway onto the floor of the exhibit, to give visitors an impression of the harrowing journey that the young mountain lion P-22 took as he crossed two major freeways, the 405 and 101, to arrive where he now calls home, our beloved Griffith Park. This big, beautiful male cat first came to the public’s attention in early 2012 after pictures of him were caught by camera traps in the park placed by the wildlife biologist Miguel Ordeñana, who at the time was collecting footage as part of the Griffith Park Connectivity Study. 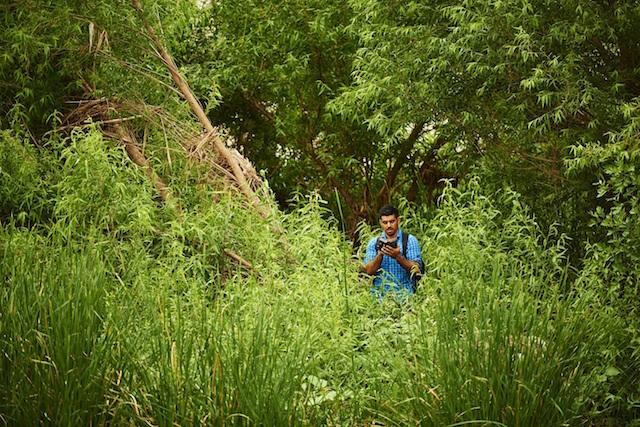 Since Ordeñana shared those images, he and other wildlife advocates, including the National Park Service that put a GPS collar on P-22 that March and gave him his moniker (“P” for puma and “22” for the number cougar they had collared), have followed P-22’s adventures in—and sometimes out of—the park. “The Story of P-22” addresses many of these events: from the bout of mange that almost took the mountain lion’s life and the iconic photographs of him by Steve Winter for National Geographic, to his brief but memorable stay in a Los Feliz mansion and his alleged encounter with a female koala named Killarney at the L.A. Zoo—all of which have continued to bring local and national attention to the challenges faced by mountain lions, and other urban wildlife, to survive. 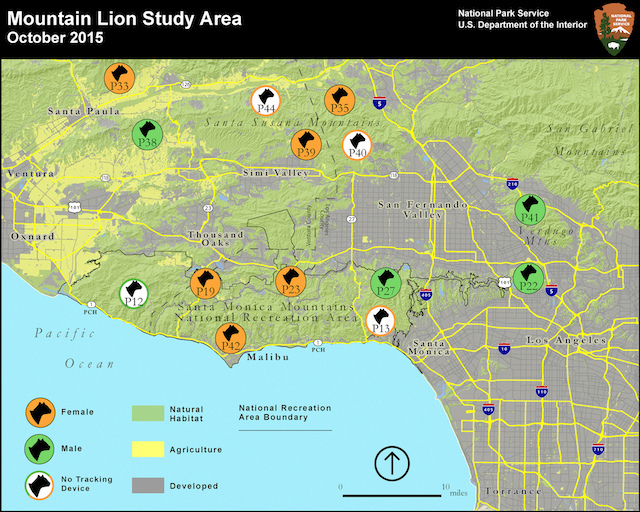 This and many other interesting stats and aspects of P-22’s life can be discovered when you visit, including immersive recordings from different spots in Griffith Park of sounds P-22 hears every day, camera trap footage of the cougar at different hours in the day, and video of a National Park Service team changing the battery on P-22’s collar, a replica of which also appears on display, as well as an actual camera trap. Watch him wander the park and “spray” his territory, as male cats do, and also see what he has in common with other Angelenos, such as bringing home “dinner” at night after a long day and being irritated by the sounds of circling helicopters—and, like other well-known residents in the city, dealing with the paparazzi. The temporary exhibit will be running indefinitely with a special lecture, “Legendary Cats of Los Angeles: Extinction, Survival, and Celebrity”; scheduled for August 17 from 6-9 p.m. with National Geographic photographer Steve Winter, National Park Service biologist Jeff Sikich, NHMLA scientist Ordenaña, and curator Emily Lindsey of the La Brea Tar Pits and Museum, moderated by Los Angeles Times writer Thomas Curwen. The Natural History Museum is located at 900 W Exposition Boulevard in Exposition Park. General admission is $12 for adults, $9 for seniors and students, and $5 for children three through 12. Teena Apeles is a Los Angeles-based writer, editor, and author. While working on a forthcoming book on P-22, she was happy to meet Miguel Ordeñana, who is one of the writers contributing to the project.